Phonographic Copyright (p) – NMC Recordings Ltd. Copyright (c) – NMC Recordings Ltd.
All works featured on this disc are published by Universal Edition Ltd. excep the Recorder Concerto which is published by the composer. © 1998 NMC Recordings Ltd.
℗ 1998 NMC Recordings Ltd. This collection deserves much wider recognition. 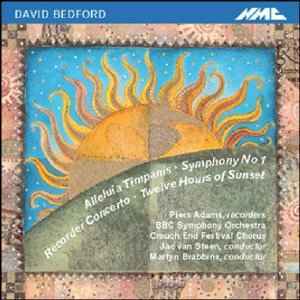 "Twelve Hours of Sunset" and the Symphony No 1 I find more impressive than his (wonderful) 70s rock/electronic/classical experiments. This is modern composition which borders on the avant-garde but it has an endearing warmth and heart to it which makes it very accessible. If you've only heard Rime of the Ancient Mariner or The Odyssey you need to hear this very well recorded CD to hear Bedford at (in my opinion) his best.